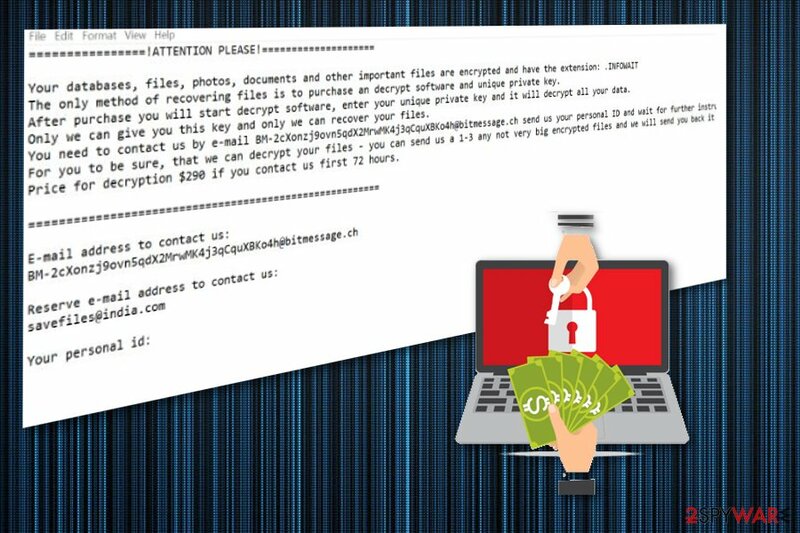 INFOWAIT ransomware uses sophisticated techniques to infiltrate computers and hide from its victims. Use Reimage to determine whether your system is infected and prevent the loss of your files. INFOWAIT ransomware is a cryptovirus that demands $290 in Bitcoin for encrypted users' data. INFOWAIT ransomware is a cryptovirus that uses RSA-2048 encryption algorithm for the code changing process. However, this is not the process that the ransomware attack starts with. After the infiltration, this virus scans the system and tries to find personal details about the user stored on the device. This is a virus that belongs to DATASTOP ransomware family and almost identical to previous versions. When ransomware is done with additional system changes it encodes various files like documents or photos and even databases. Then ransomware marks already encrypted data and generates a ransom file named !readme.txt that contains ransom message and the demand of $290 of Bitcoin for locked files. INFOWAIT ransomware virus starts with changing the parts of the system by corrupting files, adding new or altering Windows Registry keys. All these changes are made to make sure the virus is persistent and running on the system without any disturbance. When INFOWAIT ransomware is done with its changes and data encryption process the ransom note is formed in a text file that informs the user about the initial changes and procedures. The message encourages people to contact cybercriminals, but we do not recommend doing so because it may lead to more severe damage to the device or even permanent data or money loss. You need to contact us by e-mail BM-2chnzj9ovn5qu2MnNMK4j3quuXBKo4h©bitmessage.ch send us your personal ID and wait for further instructions. Price for decryption $290 if you contact us first 72 hours. You need to remove INFOWAIT ransomware as any other cyber threat, and you should do so quickly after noticing any changes to the system or encrypted files. You can do so with tools like Malwarebytes Malwarebytes because these anti-malware programs can easily detect cyber threats and delete them from the device. However, INFOWAIT ransomware is especially crucial if you want to recover files encrypted by this threat. Various experts encourage people employing automatic virus termination tools and then using data backups to restore files lost due to the malware infection. INFOWAIT ransomware is a virus that focuses on file-locking and money extortion. The most common method of spreading malware of this type is spam email campaigns, during such emails can be sent to a large number of users all over the world and this way the malicious script is distributed. Spam emails contain file attachments that may look legitimate and safe because of the common document format. However, most of MS Word or Excel files that come from these email campaigns contain malicious macros and can infect the device with ransomware directly or infiltrate ransomware spreading trojans and their malicious script on the system. The minute you download and open this document on the device, your PC gets infected. Also, spam emails may contain PDF files with downloading links or the email itself has a short hyperlink to a suspicious website or initiates the direct download. You can check these links or file attachments online before clicking or downloading on the computer. Also, avoid opening emails from questionable senders and remember that emails with subjects “financial information” and “order” or “receipt” from the service you don't use can be set to spread malware. To remove INFOWAIT ransomware and clean the system further, you need to employ professional anti-malware tools and scan the system thoroughly. Reimage, Malwarebytes MalwarebytesCombo Cleaner and Plumbytes Anti-MalwareMalwarebytes Malwarebytes can work for the process and clean the device while eliminating the virus damage. You can also use antivirus program of your choice but make sure to choose the reputable source. Automatic INFOWAIT ransomware removal gives you an advantage because it cleans the system thoroughly and eliminates possible threats or virus damage. Keep these anti-malware tools on the system and up-to-date, so your device can be thoroughly cleaned more occasionally. INFOWAIT ransomware virus can be quite persistent and even disable some functions of your antivirus program. For this reason and additional changes on the system, you need to enter the Safe Mode with Networking before the full system scan. You can follow our guide below for this and also try data recovery methods listed there. Log in to your infected account and start the browser. Download Reimage or other legitimate anti-spyware program. Update it before a full system scan and remove malicious files that belong to your ransomware and complete INFOWAIT removal. When a new window shows up, click Next and select your restore point that is prior the infiltration of INFOWAIT. After doing that, click Next. Once you restore your system to a previous date, download and scan your computer with Reimage and make sure that INFOWAIT removal is performed successfully. Guide which is presented above is supposed to help you remove INFOWAIT from your computer. To recover your encrypted files, we recommend using a detailed guide prepared by 2-spyware.com security experts. ^ RSA. Wikipedia. The free encyclopedia. ^ Lionel Laurent. Botcoin's crash looks like a real currency crisis. Bloomberg. Business and markets news. ^ Virus analysis. Virustotal. Malware scanner online. ^ Losvirus. Losvirus. Spyware related news. This entry was posted on 2018-11-27 at 06:10 and is filed under Ransomware, Viruses. You can quickly scan the QR code with your mobile device and have INFOWAIT ransomware manual removal instructions right in your pocket. How did you remove INFOWAIT virus?